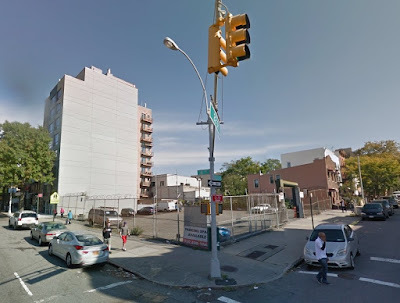 The Real Deal reports that Queens developer Steve Cheung is planning a 12 story, 81 unit condo/retail building at 685 Fourth Avenue (22nd Street). The property was acquired for $11,800,000 in early 2015. Plans filed for the new building show 16 units of affordable housing (20%), 6,400 feet of retail space, a rooftop recreation space, and parking for 18 cars. There are no mandatory inclusionary housing requirements here, and only a handful of affordable units have been built on the Fourth since its 2003 upzoning, so the inclusion of 16 units is quite a surprise. It'll be interesting to see what the income bands for the apartments will be. Many of us who live close to Fourth would have been happy if the hulking apartment buildings dumped in our midst thus far had at least provided a serious number of affordable units for area residents. There would then have been some justification for their presence. Instead we got "luxury" buildings - some of them riddled with serious construction problems -that only served to help drive up nearby rents, displace longtime residents, strain our schools and transit infrastructure, and erode the culture of the neighborhood. We deserved better. Developers made out like bandits and we got sod all. Even Brad Lander has admitted that the 2003 rezoning on Fourth "was largely a failure." ... good luck getting any cooking or chores done with the entirety of Brooklyn’s harbor front and Manhattan’s skyline panorama posing right in front of you for your daily viewing pleasure. Melt off the stress of every single day’s work with sunsets caressing the Statue of Liberty and partake in the celebrations of our Nation’s birth with fireworks displays on the East River… all from the comfort of your living room couch. Floor-to-ceiling, double-paned, insulated windows let in streams of natural light while rebuffing any city noise. Granite and stainless kitchens shine in the reflection of the gleaming hardwood floors. Sip a cup of coffee over a scene of serenity from your rear balcony, overlooking the historic Greenwood Cemetery. Learn to love coming home from the bustle of the Big Apple. There's little serenity down on the avenue.